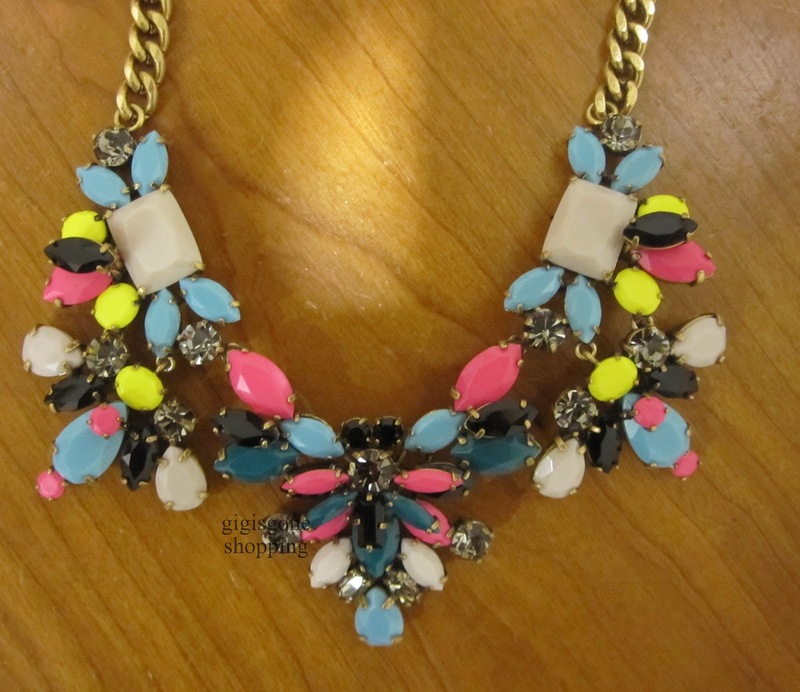 J Crew’s technicolor floral necklace (05975, $165) is currently on sale for $114.99 online & $99.99 in-store. All those beautiful colors that will go so well w/the clothing color palettes. Love the weight. Love the colors. I didn’t care for the design. I don’t like the sides hanging as low as they are. That’s sort of a cut off M shape, rather than a more rounded look than I prefer. Personal taste. The necklace is fine. This I really liked and was tempted. Given the number of bracelets I own, I’m trying to be really picky about what I add in. I only have the 2 pink colors in my wardrobe and I’m not quite sure I like the pink/blue combo together. That’s my qualm. 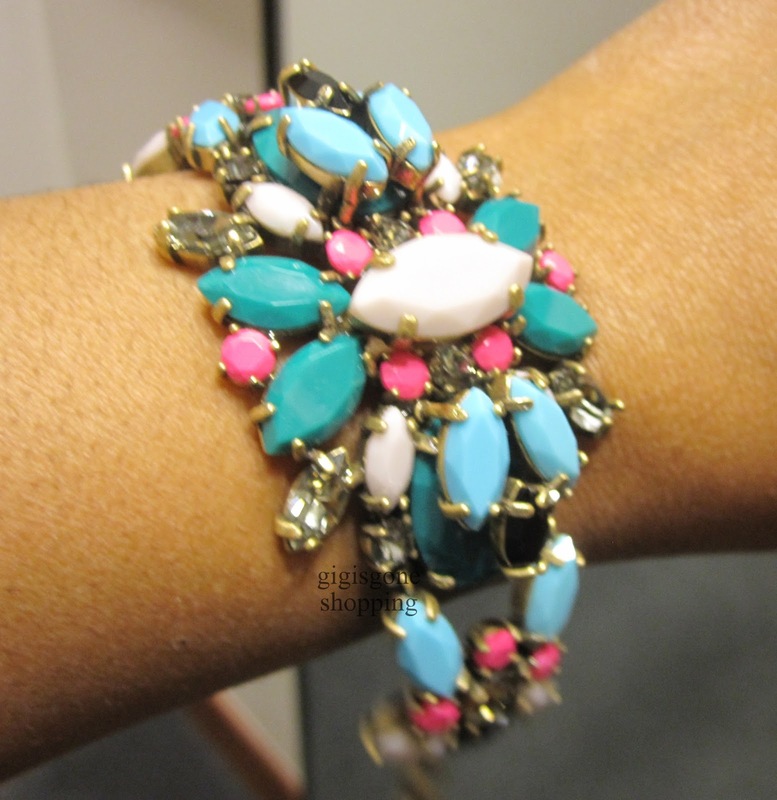 Bracelet is otherwise a-ok & very pretty. The two together. I thought they were the same. Almost. The necklace has yellow in it. The bracelet doesn’t. I like the colors in these two pieces, but they were just too busy for me. And I don't know about the names either, if something is called "floral" then I guess I'm a purist, b/c I don't know of flowers (and we grow a lot from seed here that are not everyday varieties) that have multi colored petals. Does this sound weird? It's like – do they want these to look like flowers? or a kaleidoscope design? 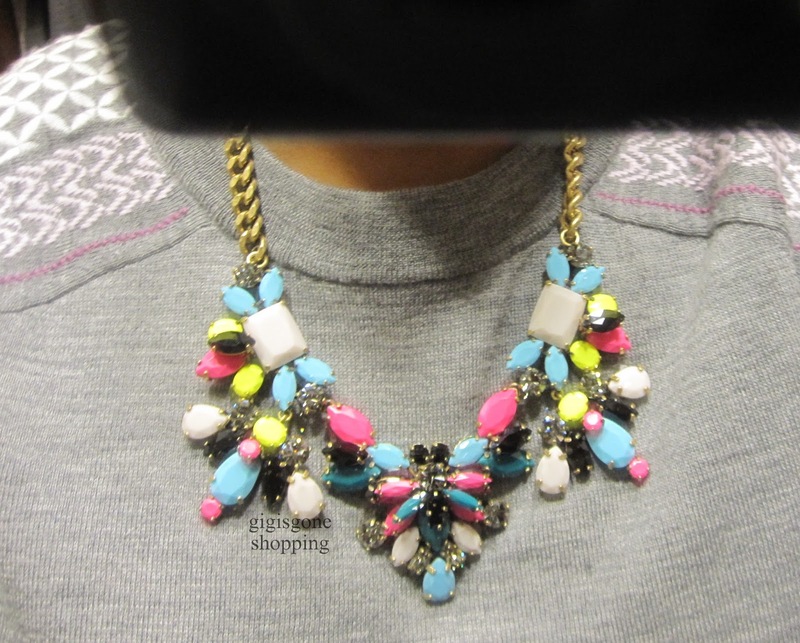 I wanted to like it, but when I held it up in front of my neck in the store mirror, it just looked confusing to me. 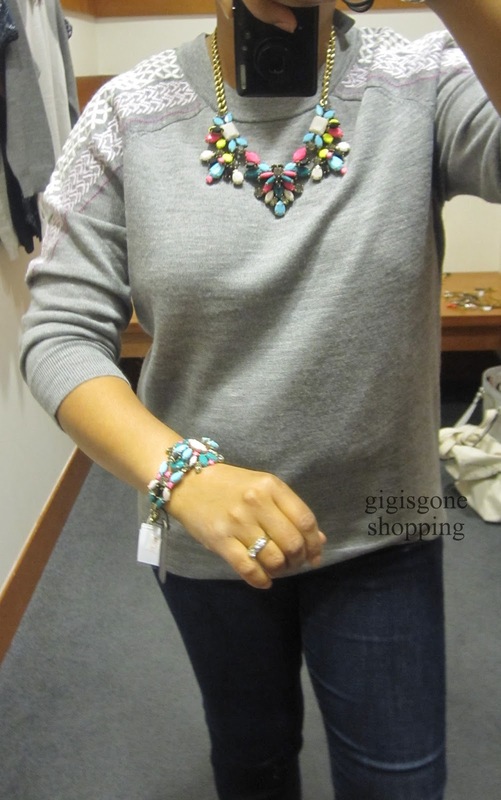 LOL Thanks, Gigi, as always for all of your fabulous pics and reviews!! Have a great weekend! Suzy – There's a crystal shimmer bracelet that's crystal. No color. 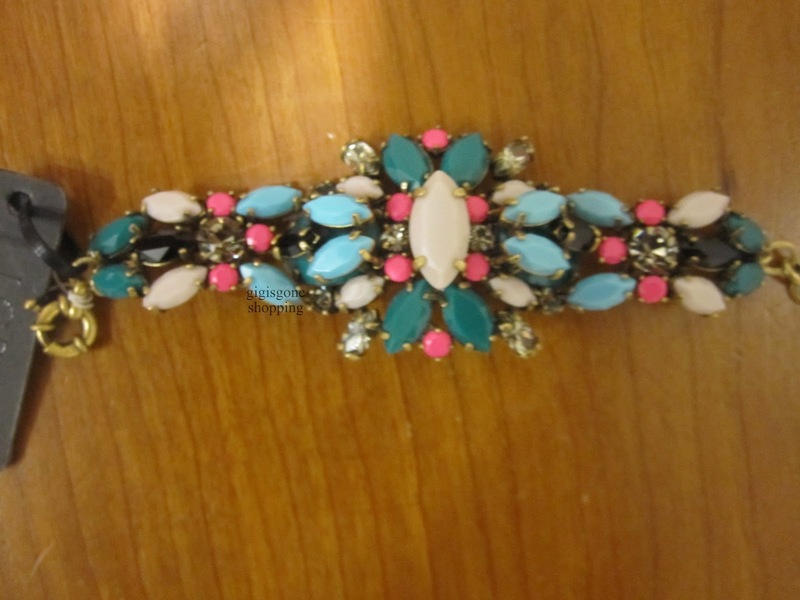 That makes more sense then this multicolor bracelet being a crystal shimmer bracelet. I agree that the names are off on these. They don't look floral to me either. I always appreciate your visits!! Hiya! Quick question that’s completely off topic. Do you know how to make your site mobile friendly? My site looks weird when viewing from my apple iphone. I’m trying to find a theme or plugin that might be able to correct this problem. If you have any recommendations, please share. Cheers! Very nice post. I simply stumbled upon your blog and wished to mention that I have truly loved browsing your blog posts. After all I’ll be subscribing to your feed and I am hoping you write once more soon! Hello there, I found your blog by means of Google while looking for a similar matter, your website came up, it appears good. I have bookmarked it in my google bookmarks. I just want to tell you that I am very new to weblog and absolutely loved this blog site. More than likely I’m want to bookmark your blog . You really have beneficial articles and reviews. With thanks for sharing with us your web page. I simply want to say I am just very new to blogs and definitely loved this blog site. More than likely I’m going to bookmark your blog post . You really come with exceptional posts. Thank you for sharing with us your blog. I simply want to tell you that I am just newbie to blogging and site-building and truly loved you’re web page. Almost certainly I’m planning to bookmark your site . You definitely have great writings. Thank you for revealing your webpage. I simply want to tell you that I am very new to weblog and honestly savored your website. Almost certainly I’m likely to bookmark your site . You actually have awesome posts. Regards for revealing your blog. I just want to tell you that I am very new to weblog and seriously loved you’re web blog. Likely I’m want to bookmark your site . You amazingly have tremendous writings. With thanks for sharing your website page. I just want to mention I am just very new to blogging and site-building and truly loved your web site. Likely I’m planning to bookmark your blog post . You absolutely come with terrific posts. Bless you for sharing with us your website. I simply want to mention I am just beginner to blogging and truly liked this page. Almost certainly I’m going to bookmark your blog post . You amazingly have fabulous stories. Bless you for revealing your blog site. I just want to mention I’m new to blogging and definitely enjoyed this website. Most likely I’m planning to bookmark your site . You definitely come with tremendous articles. Thank you for sharing your blog. I just want to say I am just beginner to blogs and truly loved this web page. More than likely I’m likely to bookmark your site . You absolutely come with awesome articles and reviews. Many thanks for sharing with us your blog. I just want to mention I am just all new to weblog and certainly savored this web page. More than likely I’m likely to bookmark your site . You absolutely have amazing writings. Regards for sharing with us your web-site. I am glad for writing to let you understand what a extraordinary experience our child gained checking your webblog. She figured out plenty of things, which include how it is like to have an amazing giving character to make others without problems know various impossible subject matter. You truly did more than our desires. Thank you for churning out these essential, trustworthy, educational as well as unique thoughts on that topic to Tanya. I am glad for writing to make you know of the terrific discovery my friend’s girl developed studying yuor web blog. She picked up such a lot of pieces, not to mention how it is like to have an incredible coaching spirit to make many people without difficulty master a number of grueling issues. You undoubtedly surpassed our expectations. I appreciate you for distributing the powerful, dependable, edifying and also cool tips on your topic to Lizeth. I simply want to tell you that I am beginner to blogging and site-building and absolutely enjoyed your blog. Very likely I’m planning to bookmark your blog . You surely have amazing articles and reviews. Thanks a lot for revealing your website. We’re a group of volunteers and opening a brand new scheme in our community. Your web site offered us with valuable information to paintings on. You have performed an impressive activity and our entire group shall be grateful to you. Thanks so much for giving everyone remarkably marvellous possiblity to read in detail from this website. It is often very useful and also jam-packed with a good time for me and my office friends to search your web site at a minimum three times weekly to study the fresh things you have. Of course, we’re at all times satisfied with all the spectacular points you serve. Some 3 areas in this posting are surely the simplest we’ve ever had. I simply wished to say thanks again. I’m not certain what I would’ve accomplished in the absence of the entire opinions documented by you on that industry. It was the scary concern for me, however , observing the very skilled manner you resolved it forced me to weep for happiness. Extremely happier for your work and thus trust you realize what a great job you are always accomplishing educating people all through a web site. I’m certain you haven’t met all of us. I was just searching for this info for a while. After 6 hours of continuous Googleing, at last I got it in your site. I wonder what is the lack of Google strategy that do not rank this kind of informative web sites in top of the list. Normally the top sites are full of garbage. I’ve learn some good stuff here. Certainly value bookmarking for revisiting. I surprise how so much effort you put to make such a magnificent informative web site. May I simply say what a comfort to uncover somebody that truly knows what they’re talking about on the web. You actually know how to bring an issue to light and make it important. More and more people ought to look at this and understand this side of the story. I was surprised that you are not more popular because you definitely have the gift. Great post. I was checking constantly this blog and I’m impressed! Very useful info specifically the last part 🙂 I care for such information a lot. I was seeking this certain info for a very long time. Thank you and good luck. I definitely wanted to send a quick word to say thanks to you for those fabulous information you are placing at this website. My time consuming internet research has at the end been rewarded with beneficial points to write about with my two friends. I would claim that many of us readers actually are very lucky to exist in a good network with very many special people with interesting techniques. I feel extremely privileged to have seen your webpages and look forward to plenty of more brilliant times reading here. Thanks a lot once more for all the details. I am not sure where you’re getting your information, but great topic. I must spend some time learning much more or figuring out more. Thank you for magnificent information I used to be on the lookout for this information for my mission. Great information. Lucky me I found your website by accident (stumbleupon). I have book-marked it for later! Hi, Neat post. There’s a problem together with your website in web explorer, might check this… IE nonetheless is the market chief and a large part of folks will omit your excellent writing due to this problem. Just want to say your article is as astounding. The clearness in your post is just nice and i could assume you’re an expert on this subject. Fine with your permission allow me to grab your feed to keep up to date with forthcoming post. Thanks a million and please keep up the gratifying work.